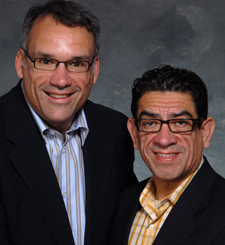 Reese ( left ) and his partner Barajas were critical parts of numerous Chicago gay groups when they lived here. The couple, together since Sept. 4, 1993, now reside in Vancouver, Canada. Reese's volunteer work included: AIDS Walk Chicago, CPNA ( Chicago's LGBT Professional Letworking Association ) , OUT AT Work ( Or Not ) , Howard Brown Memorial Clinic, Lamda Legal Defense and Education Fund, AIDS Foundation of Chicago, Equality Illinois and the Institute of Internal Auditors. His board work included CPNA in the early to mid 1990s, the Color Triangle ( Founding Steering Committee member ) , Chicago Mayor Daley’s Advisory Council on Gay and Lesbian Issues ( ACGLI ) , GLEAM ( Gay, Lesbian, Bisexual and Transger Employees of Ameritech; he was a founder of that group ) , and GLOBAL ( 1991-1993 ) . See also Javier Barajas interview.